Last Tuesday, stylish women from across the city gathered at Wear Else in the Park Royal Shopping Centre for a fall preview event and fashion show. 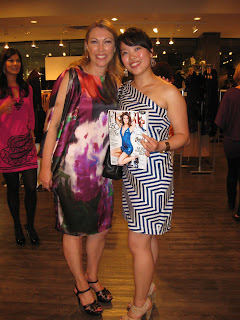 The event was co-sponsored by FLARE magazine and hosted in part by FLARE's editor-in-chief, Lisa Tant. Guests chatted as they sipped on wine and cocktails and nibbled on appetizers. Wear Else showed quality fall classics that would transition from this season to next year without looking too dated. Ladylike pieces such as wool jackets, 3/4 length wool coats and sleeveless sheath dresses graced the runway, accessorized by high-heel boots (some over-the-knee) and oversized slouchy handbags. Scarves added a jolt of colour. Although dresses featured relatively conservative cuts, a slightly higher hemline, and bold florals taken straight from the art world, lent a more contemporary vibe; these were dresses that would transition into fall well with some leggings or tights and a pair of boots or T-strap heels. Indeed, it was the accessories and little extras that stole the show: legwear, highly covetable boots, bags, chunky necklaces, and a sparkling cocktail ring. Overall, there was nothing shown in clothes that I haven't seen before, but then again, in a stagnant economy filled with skittish consumers, classic pieces that aren't overly trendy will always be a solid investment. All photos except the one below by Peter Jensen. This post also appears on Stylefinds. P.S. By the way, did I mention I got to meet Ms. Tant after the event? She was so gracious and kind, she even signed my September issue of FLARE. Yay! Knee boots are back in! What a lovely event!!! Looks like you had so much fun! What an opportunity! : ) glad you had so much fun!!! i love sheath dresses oh so much. you look so pretty! what a neat event! You look great, I am really liking the sound of this collection! I WISH I HAD A CHANCE TO COME OUT TO THE SHOW! but I was completely swamped with stuff to do so I wasn't able to make it out! boo! But it looked like a great show and that you had fun! 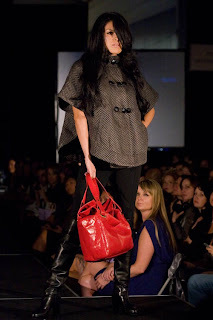 thanks for the great coverage of the event, esp the fall trends! not sure if I'm "hip" enough to pull off balmain-esque shoulders though! great pic of you and ms. tant though, love the print of your dress! Eee you're so lucky to have met her!